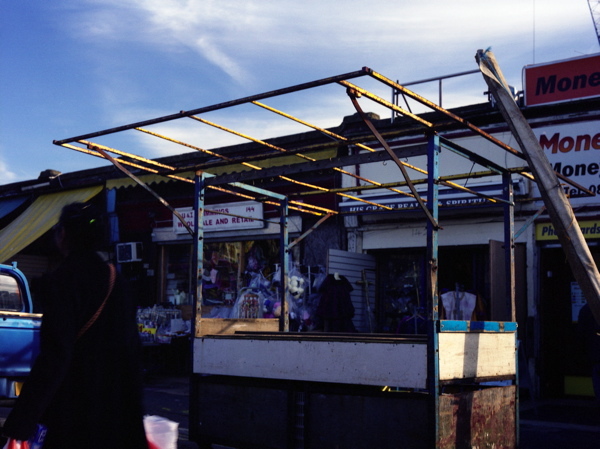 At the end of the lane in Ridley Rd Market in Dalston is a small square – of sea containers used as shops and hair salons, and corrugated iron shelters harbouring stalls – that fascinates photographer Agnese Sanvito. “It doesn’t look like London,” she explained to me, “I like it because it has its own character.” The new railway station opened nearby recently and across the line is a huge development of flats. 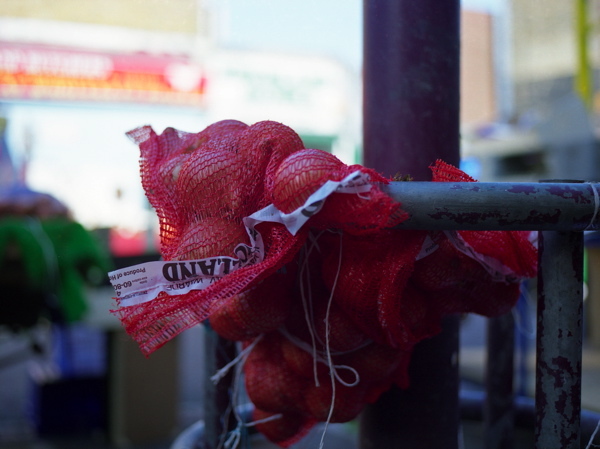 When Agnese heard that a million pound redevelopment was promised for the market, she took her camera and set out to record the elusive character of life at this scruffy end of the market, which may be about to change for good. It was one of the first bright days in Spring and she took her pictures in the warm light of late afternoon. This was in March. Just the month before, Agnese had quit her job to make a living full-time as a photographer. Six months later, Agnese can now look back on this time, secure in the knowledge that she had an assignment each week, sometimes several, and was one of the winners of the My East End Photography Competition, for the photograph of the butcher in Ridley Rd Market which she took that afternoon in March. Before Agnese returned to the South of Italy for a month to enjoy a Summer break with her family in her homeland, we met at Cafe Otto in Dalston and enjoyed a stroll around the market together. “A new place is easier, because everything is seen freshly” revealed Agnese, referring to her travel assignments as a landscape photographer,“but I have passed through Ridley Rd Market lots of times and I wanted to capture its distinctive character. Photographing a place you know requires you to think more about what kind of pictures you take.” At first, Agnese took pictures of exotic fruit and colourful cakes but then she realised they could equally be photographed in other places. “I didn’t like it, because I’d seen it before,” she explained, shaking her long straight dark hair in self-criticism and revealing a rigorous searching photographic ambition to avoid the obvious. The result of Agnese’ work is this modest set of six images focussed around the luminous picture of the butcher with a shopping trolley full of meat. There is nothing picturesque about these photographs – executed with a light touch – that record the utilitarian aspect of the market yet have subtleties which repay attention. 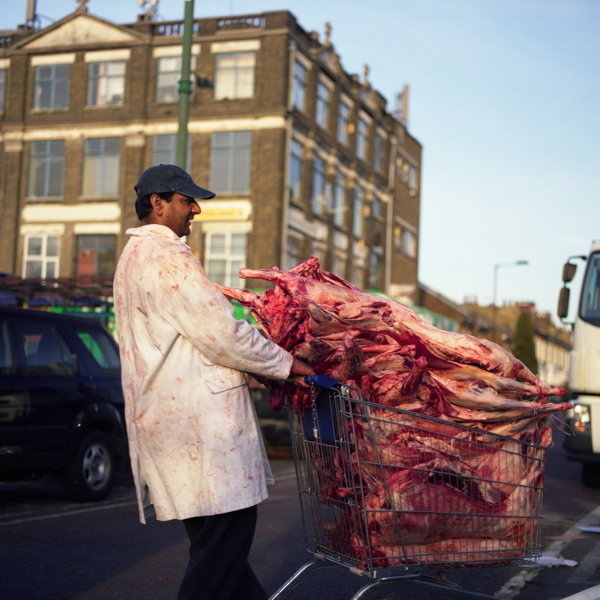 The central photograph of the butcher is an image of naked capitalism, a frank realist picture of carcasses piled in a trolley by a small trader in a blood spattered coat. But in spite of the harshness of the image, the butcher is portrayed with empathy and the warm light – rendered on film rather than using digital photography – colours the shadows blue and even casts the red meat in a soft tone. In any portrait, there is a tension between exposing or sentimentalizing the subject, and this photograph is perfectly balanced, empathetic while also retaining a respectful distance. None of Agnese’ slyly disarming pictures tell you how to look at them – they are not demonstrative – like all good photographs, they invite you to search the image. “I am interested in things that are in a process of change,” confided Agnese engimatically, so I asked her for an illustration and she came up with an unexpected example – underground toilets. Agnese is getting up at four in the morning to photograph public toilets in London that have been converted for other uses, and taking pictures of the exteriors when there is a magical dawn light and no-one on the streets. Next, Agnese showed me her photographs of the overgrown Murwillumbah railway line crossing Australia’s Byron Bay, lyrical empty landscapes with barely defined rails running through. It was when she explained to me that these were the lines that connected to Sydney and Brisbane serving the whaling industry, now closed down, that I became compelled. Agnese choses subjects that are contingent, inflecting all her pictures with an unspecified drama that the viewer must unravel. Leaving the cafe and walking through the glorious chaos of the market as it was closing for the day, with piles of boxes everywhere, crates of fruit, bales of cloth, bowls of fish and piles of meat, all rich with pungent smells in the Summer heat, we arrived at the square at the end. 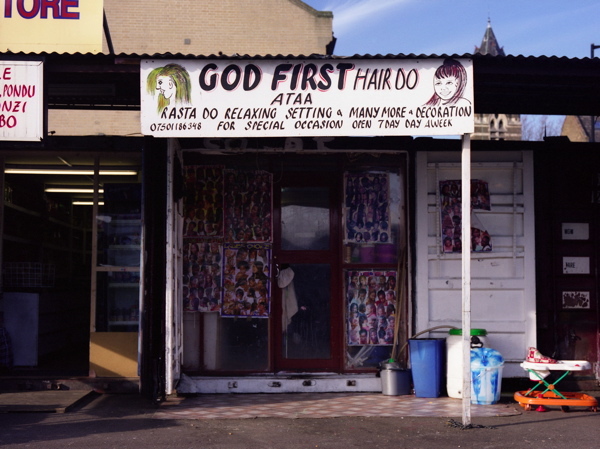 Here were the African hair salons, named “God Willing” and “God First,” operating from sea containers. Here was the haberdashers, bewildering in its proliferation of buttons and ribbons and zips and threads. Here was the butcher with piles of goats’ feet on sale and here were the wire trolleys that they use to transport their meat, exactly as you see in Agnese’ photo. “I like this market, because it is their market,” commented Agnese, referring to the traders and their local customers, and recognising that there is a dignity in this working marketplace which serves a specific community day to day. We parted at the edge of the market and Agnese promised to send me some of her pictures of underground toilets, once she has enough that she is satisfied with. I may have months to wait but I am already looking forward to it. Love the article and the photoes. I have just left Uni witha diploma in Profesional Practice (Photography). 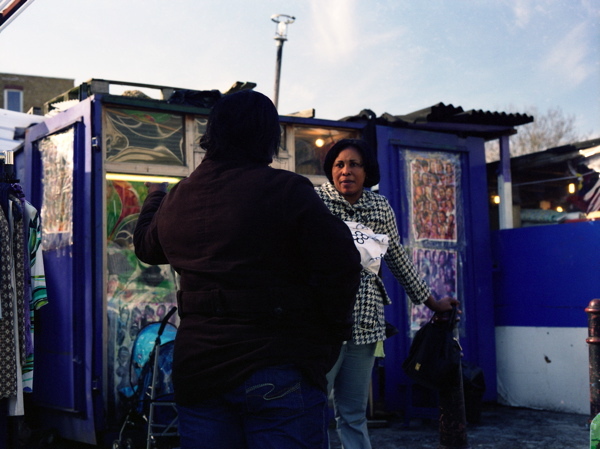 I am inspired by Agneses photography as Ridley Road market is just down the road from me. 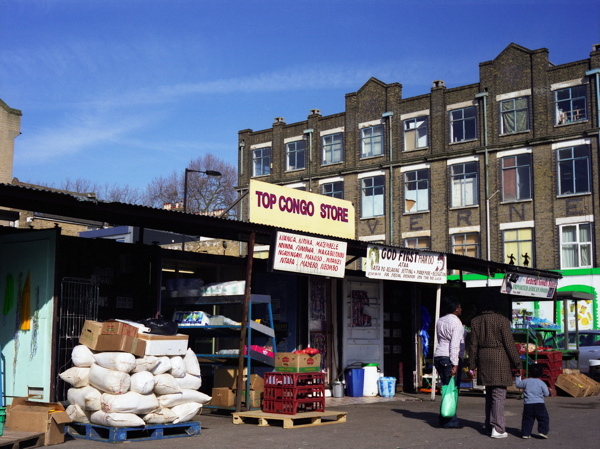 When I moved to my 1st London Squat 26yrs ago it was just round the corner from here.Dalston was then a scary place and I never felt that safe walking around on my own. Strange how I never saw the market as a photo shoot,however I wasnt a photo student then, but as she explains its best to visit a place fresh as when you live there, everything just seems as it is, and not special!